Belgian authorities urged the media to refrain from reporting on the probe into triple bomb attacks in Brussels on Tuesday that killed at least 26 after some said raids were under way in the city. "The federal prosecutor notes that certain journalists are reporting information about the investigation under way," a statement said. "The federal prosecutor urges the press to immediately refrain from conveying information relative to the investigation so as not to harm the inquiry," it said. Speaking to local television, Belgian Foreign Minister Didier Reynders said: "We fear that people are still at large" following the attacks on Brussels airport and a busy metro station. Federal prosecutor Frederic Van Leeuw earlier said the authorities "were doing everything possible to track down the attackers and to see if there are others who may have fled". Belgian public broadcaster VRT raised the death toll from Tuesday's twin attacks in Brussels to 34, with 20 people killed in the blast on a metro train and 14 in explosions at the airport. Belgium's royal palace in central Brussels was not evacuated on Tuesday following a bomb blast at a nearby metro station and two explosions at the city's airport, the palace said in an official twitter message. "Contrary to some reports, the royal palace has not been evacuated," the twitter message said. Earlier broadcaster RTBF had reported King Philippe and Queen Mathilde were in shock and the palace had been evacuated. The symbol of Paris will be bathed in black, yellow and red light in homage to "the victims, their loved ones and all the people of Belgium," she said in a statement following the attacks that killed at least 26. UPDATE: Belgian firefighters on Tuesday said there were at least 26 dead after ‘enormous’ blasts hit Brussels airport and the city's metro system. Pierre Meys, the spokesman for the Brussels fire brigade, told AFP 11 people died in twin blasts at Brussels airport. There were also “around ten killed at the Maalbeek metro station where there was an enormous explosion," he said. "Most of the wounded have been evacuated. The scene is rather chaotic," he said. A string of explosions rocked Brussels airport and a city metro station on Tuesday, killing at least 13 people, according to media reports, as Belgium raised its terror threat to the maximum level. Two explosions targeted the main hall of Zaventem Airport at around 8am (0700 GMT), with a third hitting the Maalbeek metro station, near the European Union's main buildings, just as commuters were making their way to work in rush hour. Belgian media reports said at least 13 people had been killed and 35 injured at the airport, while an AFP reporter said at least 15 people with bloodied faces were being treated by emergency services outside the metro station. The blasts come days after the dramatic arrest in Brussels on Friday of Salah Abdeslam, the prime suspect in the Paris terror attacks that killed 130 people in November, after four months on the run. There were chaotic scenes at the airport as passengers fled in panic, with a thick plume of smoke rising from the main terminal building. The blasts smashed the windows of the departure hall and sent ceiling tiles shattering to the floor. Witnesses told Belga news agency there had been shots and shouts in Arabic at the airport before the blasts hit at the airport on the northwest outskirts of Brussels. "There have been two explosions at the airport. Building is being evacuated. Don't come to the airport area," the airport said on Twitter, as police cars and rescue vehicles rushed to the scene. "All airport operations have been suspended until further notice," it said. Interior Minister Jan Jambon announced that Belgium's terror threat had been raised from three to a maximum of four. Airports in neighbouring France, Germany and the Netherlands as well as Britain swiftly boosted security in response. The blasts triggered a transport shutdown in Brussels, with all flights halted in and out of the airport and the city's metro, tram and bus services suspended. European Union staff in Brussels, where the 28-nation bloc has its headquarters, were told to stay indoors or at home. Sweden's Prime Minister Stefan Lofven branded the blasts an "attack against democratic Europe", while British premier David Cameron tweeted: "I am shocked and concerned by the events in Brussels. We will do everything we can to help." "We heard the explosion and felt the blowback," Jean-Pierre Lebeau, a French passenger who had just arrived from Geneva, told AFP, adding that he had seen wounded people and "blood in the elevator". "First we were kept together by the border police, then they gave us the order to evacuate," Lebeau said. The ceilings collapsed, he said, describing a smell of gunpowder at the scene. With shock on their faces, Jean-Pierre Herman embraced his wife Tankrat Paui Tran, who he had just gone to collect from the airport after her flight from Thailand. "The second exploded just when we got off. We ran away to an emergency exit. I think we are very lucky." An AFP correspondent on their way to the airport said roads to the terminal had been blocked and trains halted. Charlotte McDonald-Gibson, a British journalist living in Brussels, told AFP there had been ‘total confusion’ at the airport, where she was having breakfast. "Suddenly staff rushed in and said we have to leave," she said. "They rushed out and into the main terminal A departures building. Nobody knew what was going on. "It was total confusion, people were just standing around wondering what was happening." There was no immediate confirmation of the cause of the blasts. EARLIER REPORT: Explosions tore through the departure hall of Brussels airport on Tuesday morning killing up to 13 people and injuring 30 others and a second blast struck a metro station in the capital shortly afterwards, the Belgian public broadcaster RTBF said. Belgium raises terror threat to highest level: minister. The cause of the explosions was not immediately clear. Brussels airport is closed until further notice, Eurocontrol, the European organisation for air navigation safety confirmed on its website Tuesday following twin explosions. At 8am two explosions have occured in the departure hall. Emergency services are on the premises and are offering the necessary assistance. Airport operations are suspended until further notice. The airport authorities are asking to avoid the surroundings of the airport. Passengers present in other zones are ask to remain calm and to wait until further information is available. 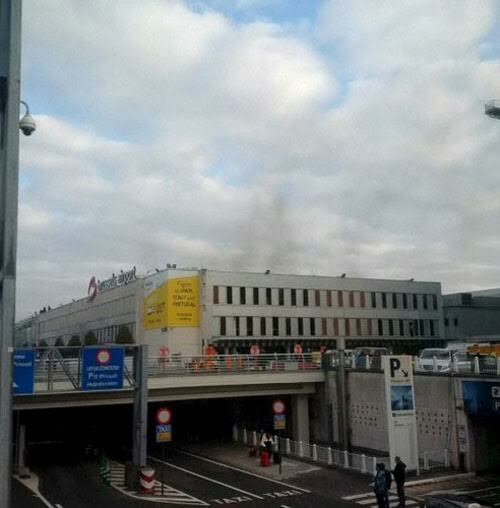 Brussels Airport has also confirmed the two explosions, stating the area is currently being evacuated. It also tweeted on its official Twitter account, asking people to refrain from coming to the terminal. Sky news in London said the blasts had occurred in the departures lounge and cited reports it had occurred near the American Airlines desk. Belgian media said rail trafic to the airport was suspended.